Stew Leonard’s has always been my favorite grocery store. When I was a kid my family used to visit the Norwalk store. I have vivid memories of seeing the farm animals and having pistachio ice cream after a shopping trip with my parents. When I got married and moved to central Connecticut, my husband and I started visiting the Newington store. Now that we have children of our own, it has quickly become one of their favorite stores as well. We usually catch lunch at the hot bar before shopping. The kids love pressing all of the buttons and watching the animations located throughout the store. We even celebrated my girls’ fourth birthday at Stew Leonard’s. 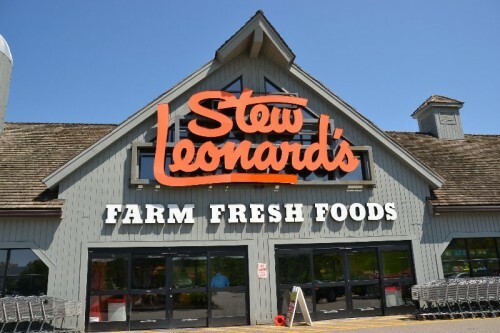 Stew Leonard’s is so much more than a typical grocery store. In addition to their great selection of fresh food, Stew’s also offers great family-friendly events throughout the year. 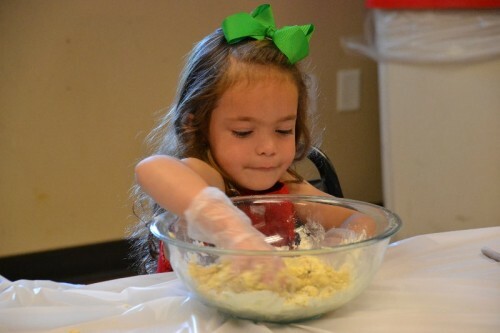 We recently had the chance to experience one of their toddler cooking classes. My kids love to help me in the kitchen and are great little chefs. They take a weekly cooking class provided through our town so I knew they would love participating in the Stew’s cooking class. 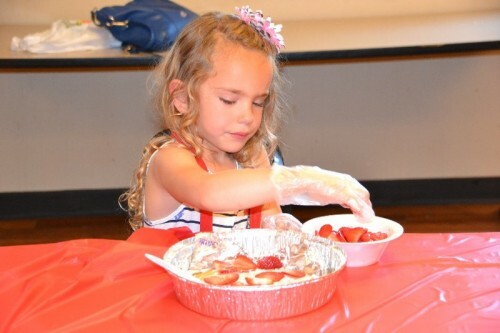 Stew Leonard’s offers culinary classes for children ages 2-12. 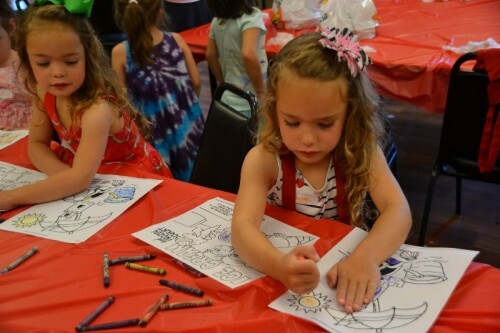 The classes are usually grouped by ages 2-5 and 6-12. Cooking classes are offered every week (some times multiple times per week) at different times. The schedule helps accommodate all families’ needs by having morning, evening and weekend classes. 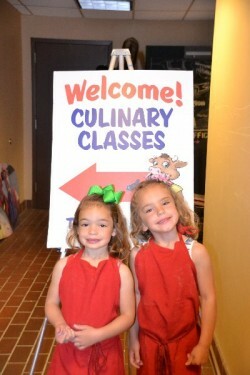 They are even offering all-day culinary camp days this summer. Registration is super easy and can be done entirely online. The price for classes varies between $20-$25. TIP: Weekend and special holiday classes are popular and tend to fill up quickly so book early. 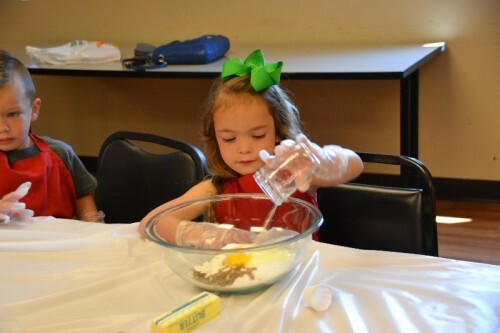 The toddler cooking classes are located on the upper floor of the store. The stairs are located between the ice cream and customer service (there is also an elevator near the bathrooms). The classroom is past the employee area. At first it might appear that you’re in the wrong area, but I promise it’s there, just keep walking and follow the signs! 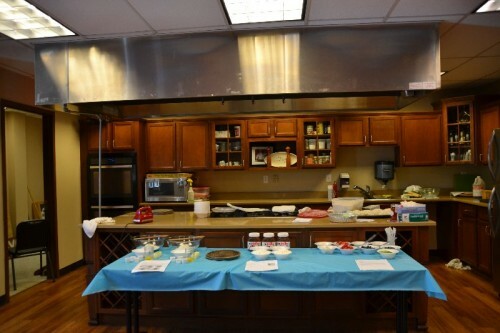 The cooking class is located in a large room complete with a full kitchen. When you walk in you’re greeted and your child is given a name tag and told where to sit. At your seat there will be an apron and gloves. Depending on the theme of the class and the number of participants there may be other tables set up with activities. 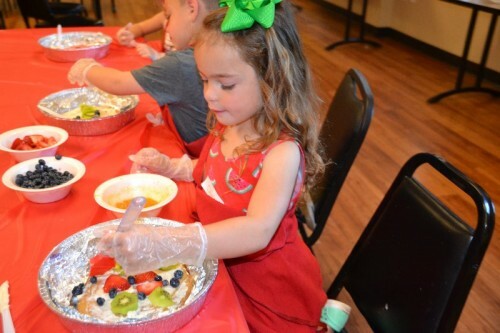 The class is led by an instructor who gives the background of the recipe and explains what the children are going to do. The kids get to be totally hands-on in the meal preparation. They get the chance to add ingredients and mix. Each class recipe is different so their level of participation varies. During our class we created dessert pizzas. The kids got the chance to make sugar cookies and decorate them with frosting and fruit. 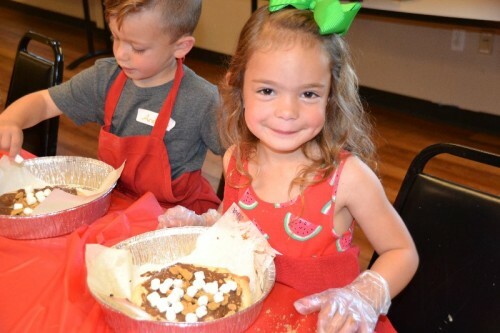 Their second recipe was a s’mores pizza with Nutella, graham crackers, marshmallows on top of a Stew Leonard’s pizza dough. The kids got to roll out the dough and add all of the toppings before it was baked in the oven. Both recipes were delicious and perfectly suited for the age group. 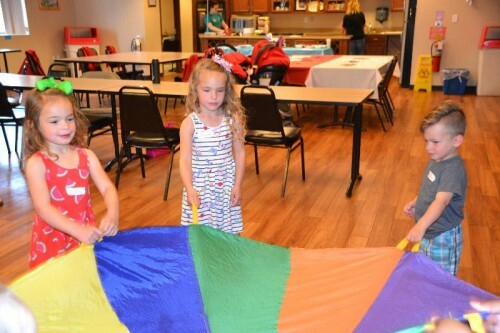 Since there was a little down time while our pizzas were baking, the instructors had arranged a game of parachute and coloring activities. I found the instructors to be really good with the kids and everything ran very smoothly between the structured tasks. At the end of the class you can stay and sample your food or box it up to take home. I always find that there is a generous amount of food to take home. 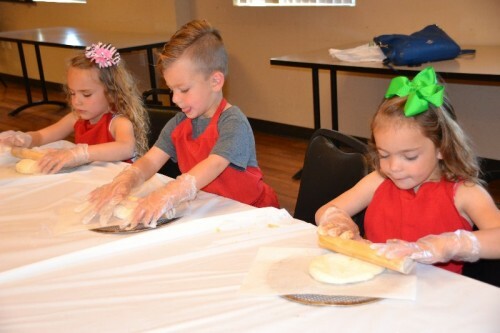 The kids cooking classes at Stew Leonard’s are great activities for budding little chefs or for anyone looking to try something new with their kids. This was our third time taking a cooking class at Stew Leonard’s and I continue to be impressed. I love that the menus are always different and the themes go along well with upcoming events and holidays . 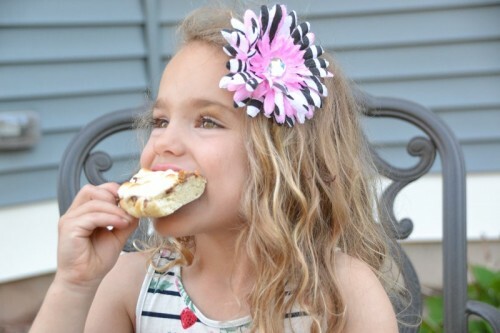 I always find the classes to be well run, age-appropriate and best of all the final product is super yummy! Any place that incorporates Nutella and pizza is an automatic winner in my book!